The true value of family is never more appreciated than during the holiday season. This Christmas lights for family ornament is the ideal gift for parents or grandparents who have meant so much to you through the years. There's room for up to 8 names to be added around this 4" globe. 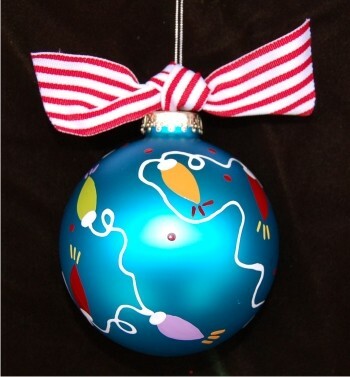 The Christmas lights for family glass Christmas ornament is entirely hand painted, so the ornament you give will be truly one of a kind, just like the person who receives it. If you're working on a family theme this year, see all of our family & relative ornaments to find something for all those closest to you.